Since spaghetti is loved by all at my house, I'm always trying to do something a little different with it so it doesn't get boring for me. 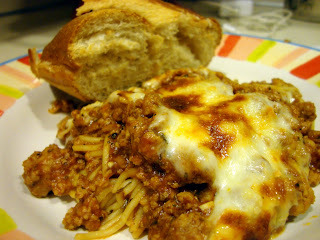 Baked Spaghetti is one of those variations. It takes my standby recipe for spaghetti and adds cheese, which is one of my favorite things to eat. Brown meat, drain excess fat and return to pan. In a small bowl, mix all dry ingredients, onion, and garlic together. Add tomato sauce and water to pan with meat, and then dry ingredients. Stir until combined well. Bring to a boil and then reduce heat and simmer 20 minutes. Preheat oven to 350 degrees. Place cooked spaghetti noodles in small baking dish. Top with spaghetti mixture. Next, top with shredded cheese, and then sprinkle Parmesan cheese on top. Bake for 10 minutes, until cheese is melted, and then place on broil for 1-2 minutes until top starts to brown slightly. Serve with french bread. YUM!